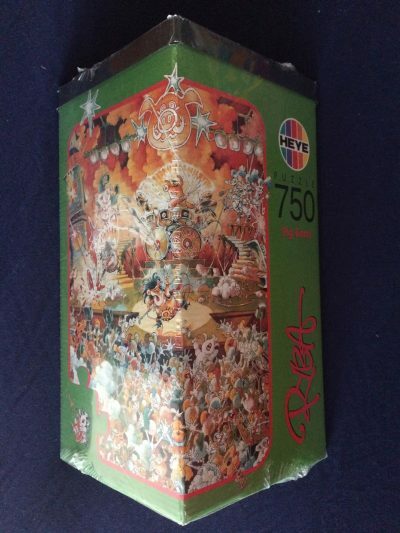 Heye manufactured this very rare puzzle in 2000. The title is New York, by German cartoonist Michael Ryba . There are two other 8000 pieces puzzles by Heye: Berlin, and 2000 Years. They are all quite rare, but perhaps New York is their most popular 8000 pieces puzzle. It is on the wishlist of many collectors and very difficult to find in this condition. 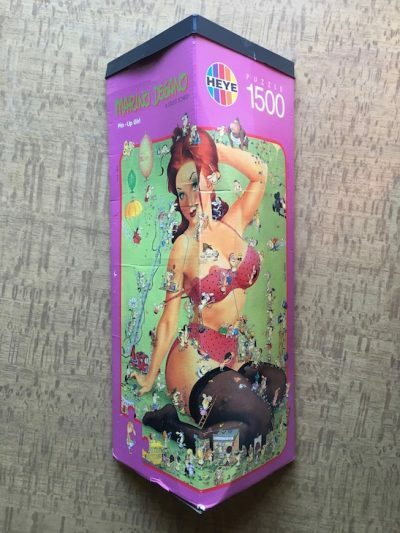 This puzzle comes in 4 bags. 3 of the bags are SEALED. One bag is open but COMPLETE, as you can see in the pictures. The pieces are in very good condition. The box has some shelf wear at the bottom. The poster is not new, and it has some wrinkles as you can see in the pictures. Puzzle size: 136 x 190 cm, 54 8/16″ x 74 13/16″.